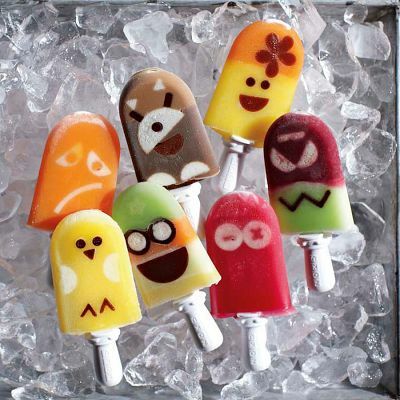 If you have received your William Sonoma catalog already that you have probably seen these fun popsicles. Last year I showed you the quick freezing zoku pop maker, but I didn't really see a reason to shell out the $50 bucks when you can make popsicles with a 99 cent mold. But now they have this fun character tool kit that lets you create fun faces in your popsicles and it makes it a lot harder to resist. And thy sell a smaller pop maker that can make two pops at a time for around $37. You can check out the pop maker and the character tool kit HERE. I have a feeling that I am going to be spending some time this summer trying to figure out how to replicate this with regular homemade popsicles. I love these! My daughters would love them too. Oh man those are so cute! I have to get those for my boys! !